Stevia is a herbal plant originating in South America. It has been used for centuries as a natural sweetener and is a lot sweeter than sugar. It has no calories, no carbs and scores a zero on the glycemic index so it is certainly an attractive alternative to artificial sweeteners for those wishing to cut back on sugar. The approval for use of stevia varies from country to country, and therefore its availability varies too. Some countries have approved it as a food supplement, but not as a sweetener, or as a sweetener only in some products. Other countries have full approval for it in all uses. In the UK and the rest of the European Union it is approved as both a food additive and a dietary supplement. It is available in powder, liquid or tablet form. The Stevia available in UK supermarkets tends to be combined with other sweeteners, so if you want to buy the pure stevia, you will probably need to get it from a health food store or online. I think the position is similar in the US, although the FDA appear to have changed their position on stevia a few times, so it is an evolving issue. A lot of people successfully grow stevia at home, and use the leaves to make their own sweetener. I’m tempted to have a go at this myself. Peel the ginger and chop finely. Boil the water in a pan and add the ginger and stevia. Simmer for 10 minutes on a low heat. Strain it and stir in the vanilla and lemon. Refrigerate. They suggest pouring the syrup onto ice cubes and topping up with sparkling water to make ginger ale. 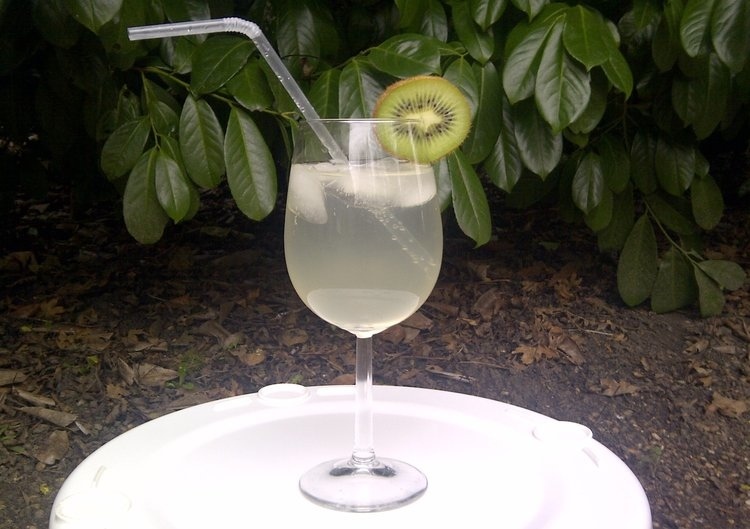 That’s what I did, which you can see in the picture at the top; it was lovely and refreshing (notice how I attempted to detract from the fact that it looks like dishwater, by clever use of a slice of kiwi!). The syrup could also be used as a cordial with still water, or as a kind of ginger tea if mixed with hot water. Most sites I found state that stevia is safe for diabetics, however I did see a suggestion somewhere that as stevia can sometimes lower blood sugar, it could exacerbate the effect of diabetic medication that reduces blood sugar, which could potentially make the level drop too low. I’m not sure if that is proven or not, but as always if you are diabetic, do consult your medical practitioner before making dietary changes. As with almost all sweeteners, there is some controversy surrounding stevia, with some studies showing possible harmful effects if taken in large amounts, and other studies disputing those findings and recording no toxicity. Personally, it seems to me a good and healthier alternative to either sugar or artificial sweeteners, to at least use occasionally, but please don’t take my word for it for yourself, I’m not a medical practioner or scientist! Are you familiar with stevia? Do you ever use it yourself? I haven’t tried stevia… there’s always a lot of press about it, but I feel “safe” with sugar (less trial and error, fewer baking mishaps). I love that I get to hear about your experimentation with it, though! Yes, I know what you mean. I probably wouldn’t attempt substituting stevia for sugar in a recipe myself, but I might have a go at recipes which are specifically made with it. Yes, it did seem to be recommended as a good choice for diabetics, apart from that one caution I mentioned. Interesting to learn. I’ve not used Stevia, but as with anything, I suppose it’s all about moderation. Indeed. From what I could tell, the suggestion that it might be harmful in large amounts was based on rats being given much larger comparative amounts than humans would eat. I would see stevia as something to have occasionally rather than a daily thing, but maybe that’s just because it’s something fairly new to me! It’s like other artificial sweeteners like aspartame–people are scared the sweeteners cause liver cancer because they did in rats. The thing to remember is that they gave rats ridiculously large doses, much larger than humans would ever consume. It’s important to keep that in perspective. A little artificial sweetener now and again is much less dangerous than daily loads of butter or excessive natural sugar. Yes, I would imagine that megadoses of most things are likely to cause some adverse effects. Like you say, moderation is the key. I might try and start using a wider range of sweetening ingredients as I learn about them, that way I won’t be overdoing it with any of them. ‘notice how I attempted to detract from the fact that it looks like dishwater, by clever use of a slice of kiwi!’ I didn’t think a post about Stevia was going to make me laugh, but there you are. Have to say I was wondering about the background of the picture. Did you position the table or was it there already? It’s actually an upturned laundry basket rather than a table! And I tried it all around my garden with different backgrounds, and this was the one that I ended up liking the most. It was first thing this morning and it was freezing, and there I was outside with an iced drink! If you don’t get round to baking the banana bread, then you can always just send me the recipe and I’ll bake it and photograph it for the post! Your dedication is commendable! If it comes to the time you want to post, and I still haven’t sent it – give me a nudge! Well it’s a bit chicken and egg because when you send me the recipe, I’ll do the post about it! Interesting article, Vanessa – thanks for posting! I’d heard of/seen Stevia on the shelves, but always dismissed it prior to this because it looked like a brand name. Now, I know more! I like the idea of “growing your own” – not many sweeteners you can do that with! Can you imagine trying to grow your own sugar supply in your backyard, or in a window planter? 🙂 I’ll have to pass that idea on to some gardener friends of mine. Thanks again for this site and these articles. They’re quite informative! Thanks Mayumi. There is a brand name of Truvia which is the stevia sweetener, but I think it is always mixed with another sweetener as well, I don’t think they do straight stevia. It would be fun to grow your own wouldn’t it, and experiment with how best to extract the sweetness from it! Thanks for sharing it on FB.